Organic photovoltaics are producing a growing number of options that promise to strongly compete with the crystalline silicon market. They offer advantages in being able to harvest less intense and direct light. They also lend themselves to flexible forms and incorporation into traditional building elements. Various options are emerging from those that seek to be applied to existing surfaces to those that will be built as structural units. Light harvesting can occur from existing buildings without the need to specifically orient them at particular angles to incident sunlight. Another advantage is that their components are cheap and relatively easy to make. With eleven patents filed New Energy Technologies, Inc, rebranded from March 9 2015 as Solar Window Technologies Inc, has announced a "spray on" window technique for its tiny solar cells. These are based on hydrogen and carbon with each cell about a quarter the size of a rice grain. Effectively a natural ploymer, they can be dissolved into liquids to allow application onto surfaces. The coatings will be translucent. They have the added benefit of being very responsive to low light. Power can be generated even from artificial lighting interacting with the cells. The technology will benefit both from sunlight and the internal building illumination. 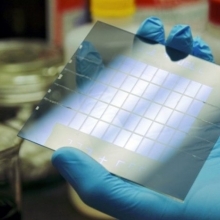 In its own segment of organic photovoltaics is the area of dye-sensitized solar cells. In spite of a good number of awards associated with the technology in the early years a couple of problems had delayed large-scale deployment. One was the early versions had quite low efficiencies. Second was that their liquid electrolyte bases would expand in temperatures over 80 degrees C, leading to bursting of the cells and their loss. The iodine base to the electrolytes, once released, could erode through underlying or containing metals like stainless steel and aluminium. 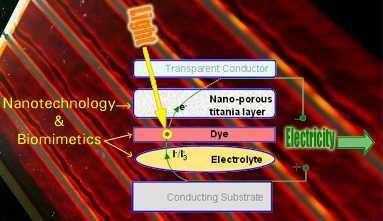 One group from Northwestern University replaced the iodine-based electrolyte solution with an iodine-based solid semiconductor. As the semiconductor also contained tin and cesium it also absorbed light boosting what would otherwise be a fall in performance in changing to the solid form. Further solar power research should boost this design to competitive output levels. One of the most effective advances in dye-sensitized solar cells was pioneered by EPFL (Ecole Polytechnique Federale de Lausanne) in Switzerland by Michael Graetzel from 1988-1991. Fine porous nanoparticles of titanium coated with the dye particles were suspended in the electrolytes hugely improving the previous very low efficiencies. One company banking its future on organic photovoltaics with dye-sensitized solar cells is the Australian origin Dyesol. Incorporated in 2004, having built on long years of research from previous companies, it is rapidly expanding its reach. Having established joint ventures in Korea, Wales, UK, with the Tata Steel group and Italy with ERG Group and Permasteelia, its recent positive independent test results in Ohio have encouraged it to establish a base in Ohio. Local funding will benefit its expansion. As with other organic photovoltaics it has proved the effectiveness of electricity generation even in low light situations. Its dyes are ruthenium-based organic molecules. Ruthenium is a relatively rare element but is used widely in many other applications. Current peak efficiencies are in the order of 11%. Dyesol is working to increase this. Light absorption can occur from either side of the panels. By incorporating the cells into many elements of buildings total energy supply can be high. 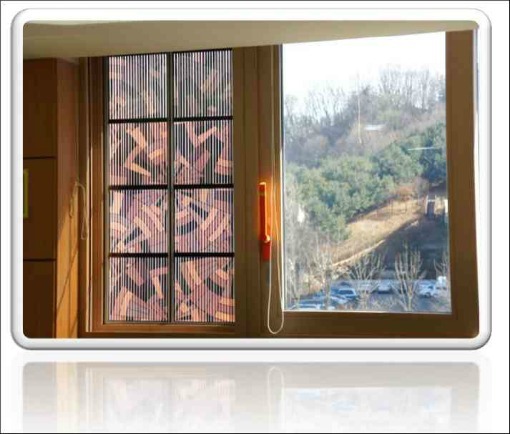 The windows it produces are made as a unit still using liquid electrolytes with dye coated titanium particles. The iodine-based electrolyte is contained in the window structure. Commercial installations are taking place in Korea. Its work with UK Tata Steel group (previously British Steel) will produce photovoltaics on steel for construction purposes. The initial 11 million pound project has aims to commercialise the production of photovoltaics on steel for roofing to enable grid-competitive power production from standard light conditions present in any country in the world. Dyesol can demonstrate voltage stability across a wide range of light conditions including cloud and haze. By 2020 it aims to contribute to a third of the UK's renewable energy supplies. The coating cells can be produced in a range of natural colours. Pigments can be modified to produce a varying effects. The cell coatings can also be used with ceramic and plastic bases. With its on-line store (accessed from Great Cell Solar homepage but not yet https) its many product elements are available to over thirty countries around the world. This allows it to partner with other institutions wishing to experiment with and create their own organic photovoltaics in dye-sensitized solar cells. Just recently Dyseol announced breaking the 10% efficiency barrier for solid-state organic photovoltaics. Its share prices on the German and Australian exchanges rose rapidly on this announcement. Solid-state components will facilitate even more stable, efficient fabrication. As with many companies, small businesses, banks and the world generally the 2007 to 2008 financial crisis caused major problems for Dyesol. Many of the initiatives with joint ventures noted above collapsed. All due to the sudden fall in demand for solar power as business retracted. Yet its intellectual property still existed. Joining a number of other ventures and research institutes similarly affected throughout the world they have gone on. Now known as Great Cell Solar, but still headquartered in Queanbeyan, NSW, Australia, they have created a projected timeline for release of their new products. Looking initially to large projects in their own country as well as China and Turkey, glass substrate dye solar cell based organic photovoltaics with perovskite technology are scheduled for commercial production in 2019. Metal based units should be available from 2020. 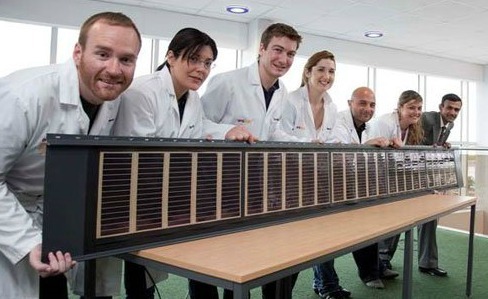 Other companies are exploring solar photovoltaics and dye-sensitized solar cells. BASF and Merck in Germany and Showa Denko and Fujikura in Japan are among these. With increasingly encouraging results and the relatively low cost localized solar-based energy production looks highly likely in the near future.